Cross-cultural issues assume huge significance in any cross-national merger and acquisition activity. M&A is one of the key instruments of globalization and a critical route to business and economic growth and yet the vital cultural issues are all too frequently buried beneath management obsession with the legal, financial and operational obstacles to integration. Up to fifty per cent of mergers and acquisitions fail to meet the objectives of any of the parties involved and the principle source of that failure is a collective inability to merge cultures successfully. In The Global M&A Tango, Fons Trompenaars and Maarten Nijhoff Asser draw on the world-renowned Trompenaars Hampden Turner cross-cultural database and Culture Compass to show how widely cultures can differ and, by reconciling the dilemmas created by that difference, how rapidly and effectively they can be integrated. 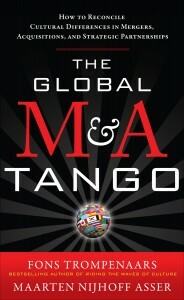 The Global M&A Tango – out in hardcover, paperback and kindle edition!! !